Hey guys, Thought I would post a few picks of what I have been up to. 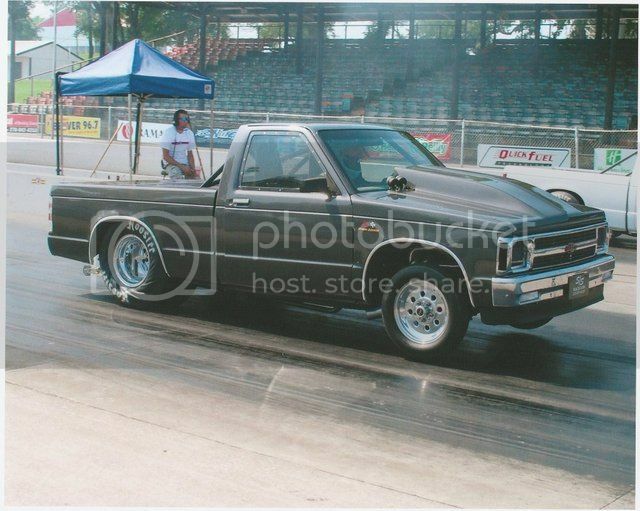 My truck had a 408 sbc in it when I bought it. 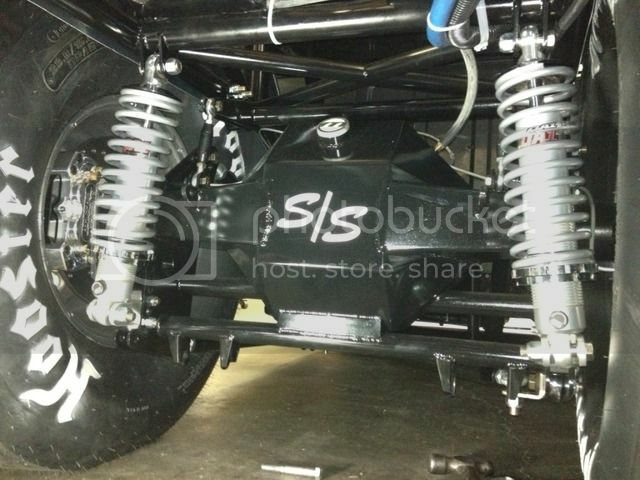 The rear end was a 9" with 35 spline axles, ladder bars and coil overs. This year I decided to upgrade some things. I had a new rear end setup put in. I went with a cm round tube back half and a fab 9 housing, 35 spline axles, 513 gears, and 33x15x15 slicks. I also built a 555 for it. I fired it up on a test stand and will be installing it this week. Looks like someone "had" some money! Looking good though!! 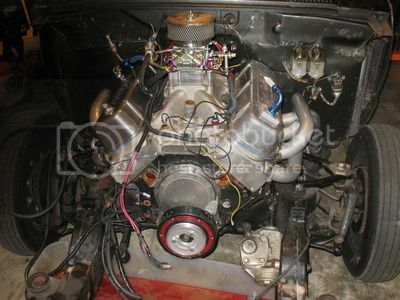 The carb is a Holley 1150 that was converted to E85 with QF blocks. The Fram was only on there for start up. I have a System 1 that I will take off the other motor. My first guess was a high 5.80 to low 5.90. Most think 5.50 to 5.70. Thanks. Key word "HAD" but after seeing it come together I have no regrets. OK have to ask.........Motor internals??? CR??Cam??Heads? Etc..
X2. They are junk and I don't apologize for that. Block is a Dart Big M, Heads are Brodix BB2Xtra, Crank is a Callies Magum, Rods are Eagle 6.535 with Wiseco pistons, Cam is a Comp .775-.748 lift 284-292 dur @ .50* 110 lobe sep, Comp rollers and lifters, Intake is a Dart that has had some porting and Nitro Plated. As for the carb I have a LM2 to help keep a eye on things and I have a back up carb. I bought a 1050 converted to Alky. It has BLP blocks and was deadly on a friends 568. He ran 4.91-4.92 in a dragster. Nice truck. I'll have to look for ya at BG. We will be down there to test on the 15th or 22nd. 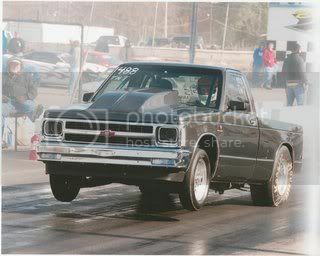 Most of the time I race at Mountain Park Dragway, London Dragway or Lake Cumberland Dragway. I only get to BG once or twice a year. What about I64 Motorplex (Bluegrass) in Owingsville? We have a stick car race there this coming Saturday. I have never been to Bluegrass. Good Luck this weekend!! It looks like it's going to take a couple weeks to change some things and get the motor in. Nice S10. Gonna be very fast. Thanks. It should be pretty quick but ya know till you send them down the track. I got the last parts I need for the Alky fuel system today. I got a BLP belt drive pump and shut off valve, fuel log and a BLP bypass regulator. Now I need to figure out where to mount a fuel cell up front. I also got a Moroso vacuum pump setup. All this stuff was on a friends dragster that he wrecked. I'm making a little progress. The 427 is almost ready to pull and I am doing some test fitting on the new one.